I hope you all had a great weekend! Mine started with a brunch/Noonday party that I hosted on Saturday and ended with a birthday dinner for my dad last night. And now I’m ready to dive into Monday! 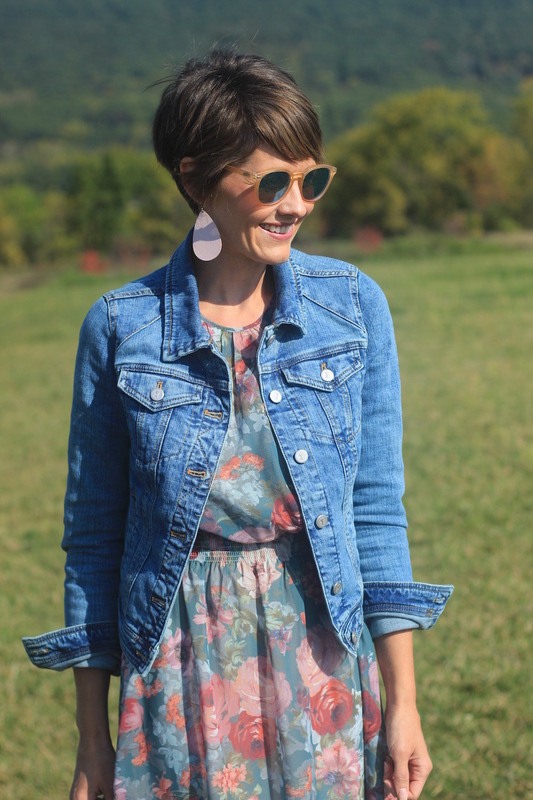 I have quite an affinity for floral dresses, well floral anything really, but midi dresses are one of my favorites. I wore this outfit to church where I knew the extra layer would be needed but my goodness it was not necessary outside! Hopefully soon! This was the denim jacket that I finally settled on recently. Ironically enough, it’s the same one that I have in a dark wash…I should have known. This Pilcro jacket was more of a splurge (although I did manage to get it on sale), but the fit, the quality, and the structure are all exactly what I was looking for in this closet staple. It has a touch of stretch which makes it incredibly comfortable and the sleeves have plenty of length, which was an issue in others I had tried. Love it! The Julie Andrews shot is priceless!